Coquina is a bright and beautiful sandalwood fragrance embellished with tons of orange blossoms and juicy clementine EO lavishly spread on to hot beach sand that has been softly misted by sea-spray. The fragrance is enhanced with a little plumeria (frangipani) absolute, coconut and a delicate touch of ginger essential oil. Coquina marries sand and surf with an incense like sandalwood blend, juicy citrus and exotic florals. On cold sniff the orange blossoms, clementine and sandalwood dominate. On the skin the sea mist and sand are detectable after the first few minutes of wear. The coconut and ginger are very subtle but add important nuances to Coquina's profile. Plumeria absolute smells nothing like its synthetic counterparts. In this blend, it is used lightly to add body to the orange blossom without overpowering. On the dry down (which comes quickly) the light sandalwood notes dominate with alternating currents of sand and sea spray. The floral notes are primarily top notes that recede into a very tame and faint presence. 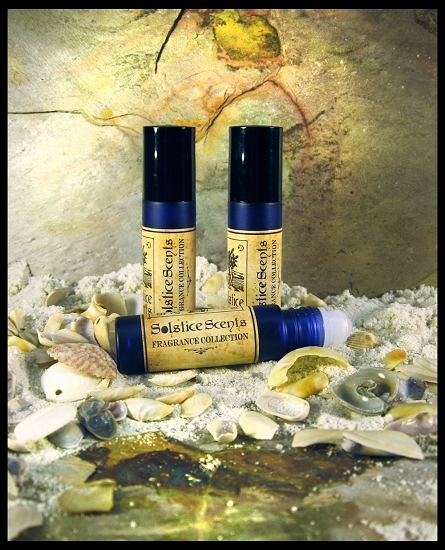 Coquina is a feminine soft tropical woods blend that is very wearable and perfect for summer! I love this scent! Beautiful sandalwood scent with a little beachy tropical note-very soft and yummy. Initially it is quite citrusy-that kind of bitter citrus but quickly goes into this lovely sandalwood scent. I keep smelling my arm and getting whiffs-can occasionally get a tiny whiff of the plumeria-just love this! Will be a favorite! I have this fragrance in the bath salts and it's not one of my favorites. It makes me think of Juicy Fruit gum and baby powder (a really dry and powdery sandalwood, I think). Coquina is very heady, to my nose - this scent is not for the faint of heart. I primarily smell orange blossom, sandalwood, and a teeny bit of coconut. I do like this fragrance, but I think it's just too strong for me (much like Tropical Moon). If you love strong floral scents, you need to give Coquina a try - it will not disappoint! Only got a sample of this because of the orange and the plumeria in the blend. On the first smell and application it was spicy smelling and then the dry down on me became more of the plumeria. This blend isn't really to my liking but I think it's still a good, complex blend if you like plumeria. What a vibrant tropical summer perfume! The strongest notes on my skin are citrus and sandalwood, with hints of spicy ginger and salty beach air. Wearing this makes me want to move to a Caribbean island and live in a hut on the sand. Now, where's my suitcase? Straight out of the vial Coquina smells like spicy oranges to me. Once it has sat on my skin for a few minutes the grounding scents of sandalwood and salty beach emerge. While other people seemed to enjoy this morph, I actually preferred the tartness of the citrus. The scent turned into a very beachy, aquatic type floral on my skin. Coquina could be a distant cousin of Heart of The Night in that that have a tropical feels and feature orange as a main note. The orange in Coquina is a little stronger and more forward than in Heat of the Night. It's heady and spicy, and maybe a little more brisk from the aquatic notes, so I'd call this the more outgoing of the two. In the vial, Coquina smells slightly aquatic, with sandalwood and orange notes. A bit similar to Heat of the Night that way, but much less sweet and deep. On skin it's all sandalwood with a strong dose of florals. It's clean and a little powdery, and there's a kind of "wet" smell to it that's probably what made me think "aquatic" on cold sniff. The floral elements get stronger as it dries on my skin. I'm new to Solstice Scents (and this Forum) and Coquina is one of the samples I ordered - I have 12 that I am going through (2 at a time) to see which my husband likes. This is one we both like. Is this the right place for me to ask if the other forms of Coquina (like the bath salts) are only available during a certain part of the year?